Sleep deprivation is a concern for both adults and children. According to a 2016 study by the Centers for Disease Control and Prevention, more than a third of American adults aren't getting enough sleep. Inadequate sleep can have serious health consequences, including increased risk of developing chronic conditions such as obesity, diabetes, hypertension, heart disease, stroke, and depression. It's also dangerous. According to the National Sleep Foundation, inadequate sleep is thought to be the cause of 100,000 traffic accidents, 76,000 injuries and 1,500 deaths yearly. The American Academy of Sleep Medicine (AASM) recommends that adults ages 18 to 60 sleep at least seven hours a night for optimal health, and the National Sleep Foundation says adults up to age 64 should sleep seven to nine hours nightly. For children, not getting enough sleep can be particularly problematic. Their bodies and minds are still growing and maturing and sleep is a crucial part of healthy development. Studies have shown that getting enough sleep improves kids' attention; behavior; emotional, mental and physical health; as well as their ability to learn and remember. When kids don't get enough sleep, their bodies aren't able to fight off infections as well (a big problem for school-age kids, who are constantly exposed to contagious illnesses such as colds in the classroom). Lack of sleep in kids has also been linked to obesity and mood swings and can interfere with a child's ability to concentrate and pay attention. That's why it's especially important for parents to take steps to make sure kids get enough sleep. If your child regularly fights going to bed or has trouble going to sleep, be sure to set up good bedtime routines and talk to your doctor if those measures still don't add up to enough zzz's. If your children aren't getting enough, don't fear. You can take steps to ensure they get the sleep they need. Having an established bedtime routine such as a bath, a story and dimmed lights or soothing music can relax children and help them fall asleep. Also, look out for signs that your child is not getting enough sleep such as trouble staying awake in school, irritability and trouble waking up in the morning. Screen time is a growing factor in kids not getting enough sleep. Texting, Instagramming, and TV make it hard for kids to fall asleep and sleep well. Do not allow children to bring a television, cell phone, tablet or computer into their bedroom. This is also a great cell phone safety tip for parents because they can better monitor how the phone is being used and step in before problems such as cyberbullying or inappropriate use become issues in a child's life. Help kids learn how to manage their homework. Kids today are getting more homework than previous generations, even in the younger grades. Help your child learn how to figure out how to manage assignments well (such as by not waiting until the last minute to do a project that may take several days to complete and doing homework soon after getting home instead of before bed) so that she is less stressed about homework and can go to bed on time. 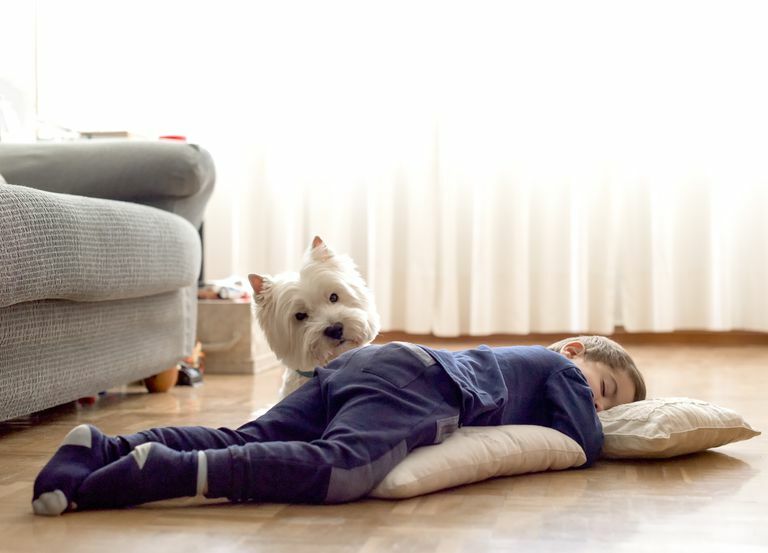 If your child still fights going to sleep, look for reasons why he may be reluctant to go to bed, such as wanting to stay up with older siblings, being overtired or even anxious about something. Do You Know What Is Interfering With Your Child's Sleep? How Much Activity Does a School-Age Kid Really Need? When Can Your Child Walk to School Without an Adult?